"Rest-A-Shore" is located in beautiful Navarre Beach where the pace is relaxing and the people are family friendly. Six miles of white pristine beaches make up the island with quaint restaurants and shops that the locals enjoy as well as our visitors. Large grocery stores, drug stores and fast food chains as well as local amenities are within 1 mile from the condo. In a 20 mile radius there are several golf courses, shopping outlets, movie theaters, more restaurants and adventurous tourist attractions to complete your vacation plans. This condo is so roomy it feels like your own private beach house. Located on the first floor, you see the sand and the emerald waters from all the southern windows. At almost 1500 square feet, guests can enjoy plenty of space in all the living areas, bedrooms and even baths! The master suite has balcony access, a large jacuzzi tub with separate shower and a walk in closet for tucking away those suitcases. The second bedroom area and hall bath can be secluded by use of a privacy door that creates a second suite. All entertainment and needs are met here. For catching Grouper and Cobia try our 1400' Pier. 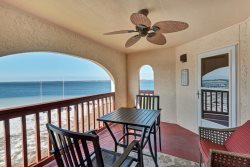 This gem on the Emerald Coast can be found between Destin and Pensacola and offers a serene vacation without the stress of large crowds and traffic clogged roadways. Come check out our piece of paradise and see why our family loves Navarre Beach! This unit requires a 3 night stay. The Navarre Properties team was great to work with. I will definitely search their site when looking for a rental for my next beach vacation. The property was immaculate upon arrival. It had all the necessities we needed to prepare meals and even had a few beach items available to use like chairs, inflatables, crab hunting nets and buckets, and castle building supplies. The complimentary beach chair service was a very nice bonus.